On January 1, 2019, Terri Hollingsworth was sworn in as Circuit/County Clerk for Pulaski County. She is the first African American female to hold the position (and, indeed the first African American of either gender to do so). Ms. Hollingsworth has worked in management positions in both the public and private sectors and nonprofit organizations. She has served on all levels of government and began her career working for the City of Little Rock as a city planner and later as the economic development administrator. Ms. Hollingsworth has also worked for Arkansas Secretary of State Sharon Priest and was tapped to be the Director of the State Board of Election Commissioners. She managed the board’s daily operations and $3.2 million budget, monitored and effectively communicated the state’s position on election legislation, conducted statewide poll worker training, and was the liaison and primary contact to legislators. 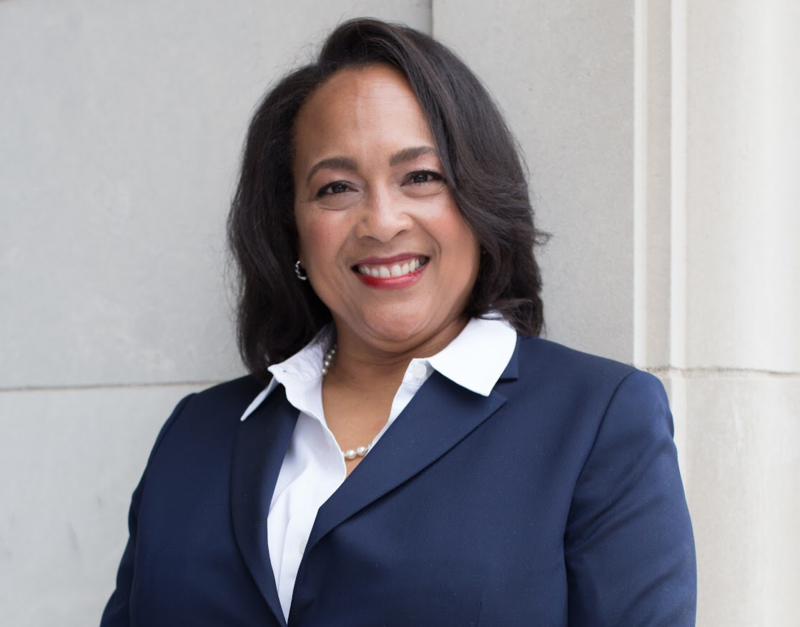 Ms. Hollingsworth served as the Chief Administrative Officer at the Delta Regional Authority (DRA) and oversaw the daily operations of the federal agency, supervision of staff and operational management of board members, elected officials and stakeholders. Terri remains an active member of the Delta Leadership Network which supports the DRA’s work in eight states and the efforts of the Delta Leadership Institute. Before her election, Ms. Hollingsworth served as a senior advisor for business strategy at Peter Damon Group, a national strategic public affairs, business development and event management services firm. Ms. Hollingsworth is a member of Jack and Jill of America, Inc., Links, Inc., Delta Sigma Theta Sorority, Inc, and is on the board of Audubon Arkansas. A graduate of Howard University in Washington D.C., she earned a Master of Business Administration from the University of Arkansas at Little Rock. In front of Robinson Center, one of the sculptures is called “Let the Music Play.” 79 years ago today, the music played on the front steps of the building as construction continued on the inside. On the afternoon of December 18, 1939, 500 school children from elementary schools were joined by the A Capella Choir of Little Rock High School as they sang Christmas carols on the front steps of the auditorium on a weekday afternoon. The singers were accompanied by the Little Rock High School Brass Sextet. The invocation for the event, which was sponsored by the Little Rock Council of Parents and Teachers, was delivered by the Right Reverend Richard Bland Mitchell, the Episcopal Bishop of Arkansas. A Christmas tree in front of City Hall was lit up as part of the ceremony as well. 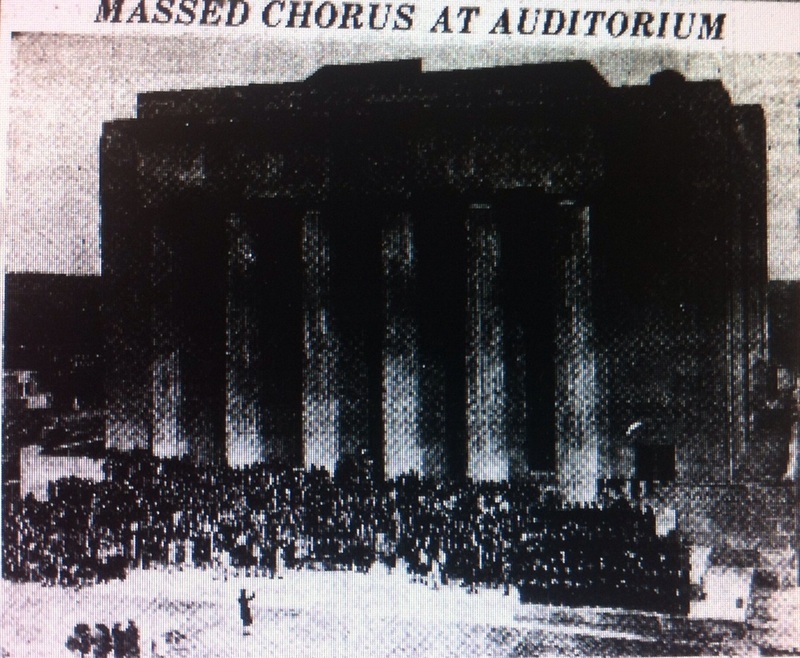 Media coverage noted that the audience witnessing the program stood on the front steps of the Pulaski County Courthouse, the side lawn of City Hall and in front of the steps of Robinson Auditorium. It was also noted that most windows in the nearby government buildings were filled with people watching the festivities. On Monday, December 4, 1939, a dozen of Little Rock’s aldermen reported to the county jail to serve sentences for contempt of court. The previous Monday, the twelve council members had voted against an ordinance which had been ordered by the judge in an improvement district matter. The other aldermen had either voted in the affirmative or had been absent. Because the twelve had refused to change their votes since that meeting, the judge ordered them jailed. Mrs. C. C. Conner, the only female alderman, was not jailed but was fined $50. The eleven men were held at the jail, though not in cells. Newspaper photos showed the men playing cards in a conference room. In order to get out of jail, the judge gave the aldermen the chance to change their votes. Mayor J. V. Satterfield plead with the judge to let the aldermen leave the jail to attend the meeting at City Hall, which was nearby. He requested that the city be allowed to maintain “what little dignity remained” by not having the meeting at the jail. The judge relented, and the aldermen were escorted by deputies to the council chambers. Today, the Arkansas Symphony wraps up its holiday music concert at Robinson Center. Similarly, 77 years ago,on December 18, 1939, the sounds of Christmas carols filled the air at Robinson. Only that time it was outside the building, not inside. That afternoon, 500 school children from elementary schools were joined by the A Capella Choir of Little Rock High School as they sang Christmas carols on the front steps of the auditorium on a weekday afternoon. The singers were accompanied by the Little Rock High School Brass Sextet. The invocation for the event, which was sponsored by the Little Rock Council of Parents and Teachers, was delivered by the Right Reverend Richard Bland Mitchell, the Episcopal Bishop of Arkansas. A Christmas tree in front of City Hall was lit up as part of the ceremony as well. 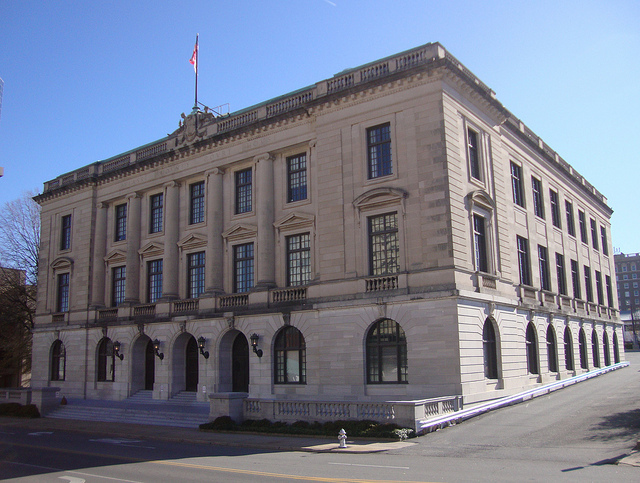 Media coverage noted that the audience witnessing the program stood on the front steps of the Pulaski County Courthouse, the side lawn of City Hall and in front of the steps of Robinson Auditorium. It was also noted that most windows in the nearby government buildings were filled with people watching the ceremony. Right now, music is silenced at Robinson Center. During the renovation, violins and tubas have been replaced by saws and heavy equipment. Similarly, 76 years ago, the halls of that building were alive with only the sounds of construction. But out front, on December 18, 1939, the sounds of Christmas carols filled the air. Similarly, 75 years ago, the halls of that building were alive with only the sounds of construction. But out front, on December 18, 1939, the sounds of Christmas carols filled the air. On Monday, December 4, 1939, a dozen of Little Rock’s aldermen reported to the county jail to serve sentences for contempt of court. The previous Monday, the twelve council members had voted against an ordinance which had been ordered by the judge in an improvement district matter. The other aldermen had either voted in the affirmative or had been absent. Because the twelve had refused to change their votes since that meeting, the judge ordered them jailed.